I simply can't believe it is June! Last night, while fishing, one single dead leaf dropped from the tree, and floated down to the still, glassy river. It reminded me of Fall! Fall salmon? Are you on your way? OK, it's a bit early. The ifish booth gave away tickets for an Okuma Epixor reel, and I will announce the winner.... RIGHT NOW! It is "CrazyFish" board member, Ken Schneider! Congratulations, Ken! Please send me your mailing address, or make arrangements otherwise, to pick it up! The EF 30 is a beautiful little reel, with a very smooth drag! I was amazed that some people that meet me, greet me, and tell me how great ifish is, but that they didn't even know about the discussion forum! Huh? That's where the heartbeat of ifish is! There is a large logo up at the top that says, "Ifish Discussion Forum" Click on that, and it will transport you into a wild world of fishing. It's somewhere between the "Jerry Springer Chinook" show, and a day out on the boat with the guys. No, wait! There is some good information out there, too! Now... A lesson! A very simple lesson... but a lesson for all of you, nonetheless! While fly fishing, have you ever leaned over to release a fish, and the contents of your vest pocket unloads into the water? That Velcro or snap is there for a reason! Use it! Yes, I am talking to myself, and I guess that is a lesson to be learned in itself, but it's not the main point that I'm getting to. If you do drop your box of flies in the water, make certain that once retrieved, you lay them open in the sun so that they will dry! Do not put them away wet! Do not be so satisfied that you were able to retrieve them, that you forget this! I know of a guy who lost hundreds of flies by putting them away wet! Last night, I carefully put 10 new flies that I bought at the tackle swap meet into my cutthroat box. I was excited to try them, so I stuck them in my upper vest pocket, and set out. First cast, I was successful! As I brought the beautiful little cutthroat in to release him, I leaned over, and my new box of flies tumbled into the current and left me. I had to carefully release the fish, so the box was on it's way. ARGH! Kilchis nudged the box with his nose, and... left it to swim back! "NO, KILCHIS! Get the box!" He turned around, nudged it again, and pushed it further out in the current. Then, he turned around to swim back to me! "KILCHIS!!!" I began my walk downstream, to see if the current would bring the little green box back to me. I kept trying to lure Kilchis out to get it. How frustrating! He'll retrieve a useless stick, but a box of flies? NO WAY! "Kilchis, pleasssssse!!!" I begged. He spotted a dipper, and was off on the chase. Half of a mile, downstream, the river loses it's momentum, and a wide, deep pool forms. It was here that I had some very sincere words with Kilchis. I knelt by his side, and said, "Kilchis, I need that box! Go fetch it up!" He looked at me closely, and gave me a big lick on the face, as if to say, "Love you Mom! See you later!" Off he went, to dig a hole in the sand. So, in jeans and tennis shoes, I waded out in 50 degree water, to my waist to retrieve my fly box. Kilchis swam out by my side, obviously overjoyed that I was going swimming with him. When I got to shore, I put the box in his mouth and praised him with all I had. Maybe next time! I did lay my flies out, thanks to Bill's reminder. Kilchis is cuter than all get out, but he doesn't have an ounce of "tackle retriever" in him, by any means. I think from now on, I'm going to store my flies on a stick. If you have never posted on the discussion forum, you could win an Okuma Reel! Click here! I really do love my boys... Even though they aren't the same as when they were little. Even though I get frustrated with teenage challenges, every stage has it's benefits! FACT: They are growing up. Sometimes, I get teary eyed and nostalgic. I long for days past, and say to them, "Hey! You guys! Let's go to Seaside and spend the night, and do the arcade thing!" It's answered by, "Uh... Mom... I can't, I have band practice." Or a date, or a movie, or... you know, adult like activities. Hey! I'm more of a kid than my teenagers! When the kids were very small, I played a game with them that I'll not forget. They hated to have their hair washed. I invented a character called "the shampoo lady." I'd walk in as Mom, and tell them it was time to wash their hair. They'd freak out! "Noooooo Mom!" So, I'd tell them I'd be back in a while. I'd race to my bedroom, pull out the wildest scarves and garb jewelry, transform myself into a ridiculous character, and swoosh into the bathroom! "HELLO! I'm the shamppoooooooooo lady!" They'd giggle, but I kind of think they, in their child like way, believed I was a different person!" They'd let the shampoo lady wash their hair with no complaints!! After washing, I'd leave, telling them not to tell their Mom. So, back into the bedroom I'd go, take off the garb, and return as Mom. "Nooooooo Mom! The shampoo lady was here! She washed my hair! See???" They would show me their wet hair. "What?" I'd ask, incredulously. "Who is the shampoo lady?" They'd try to explain, in their four and five year old ways. I'd try to not believe them at first. In fact, Mom never believed in the shampoo lady, but the kids were serious. They knew the shampoo lady lived! Back to the bedroom, I'd go, switching characters until bathtime was over. I had fun with that! Andrew is 15 now, and in a rock band. A "shock" rock band, I might add. Truthfully, for what they do, they are really, really good! Their guitarist is probably as good as any professional, and he is only 14! He is amazing to listen to! Today, I'll do just that, as they perform in a talent show. Last night at the graduation ceremony, Kyle Smith, the guitarist, took home the "Most talented jazz musician" award. Andrew plays bass. Taught himself how to play, and I'm very proud of that, also! Anyhow, I chose to "choose my battles" and turned my head away, as Andrew died his hair black. ISH! David's graduation was last night, and I was very proud as he was selected as one of the top musicians. My boys are grown. Somehow, all day yesterday, as I thought about things, my eyes welled up with tears. If it is this bad now, how will it be when they graduate from high school? Still, I was transported back to their childhood this week, as the sun shone, and the boys giggled and headed out to the river to swim. Up in my bedroom, I listened to the wonderful music of water splashing on the river, kids yelling, and Kilchis barking. I recorded it in my mind, for days when they are gone. I do have one very serious wish. I wish that the shampoo lady could return, and wash that darn color out of Andrew's hair. It frightens me! I still have the scarves, the jewelry, and I think I can still swoop, and be gregarious, like I was ten years ago. I'm going to try it, tonight. Many of you know the struggles I have been through with my eye sight. That known, you can imagine how special a great pair of binoculars would be to me. I find it so extremely fascinating to be able to see small details, that I now walk around with these precious optics nearly glued to my face! Read about my new Nikon Premier LX here! One of my friends took a halibut trip with Mark Charlton and did a pictorial review. If you'd like to see, click here! Last night I hooked a 13 1/4" cutthroat out in back, on a spruce fly that I got at the Swap Meet, from Scott Kappes. Thanks, Scott! It fought so hard that I had to palm the reel! COOL! The fly works! Stay tuned, and watch for Scott's new show. It's changed from The Hot Tamale show, to Northwest Outdoor Adventures. Coming soon! I can't believe it! School is out, and I slept till nearly 7:00! Whoooo hooooo! Stay cool out there, summer is here, and the temperatures are soaring! The flies are hatching, and it's time to fish in cut offs and tee shirts!! I decided to declare June 14th, Official Fish, Clip and Trash day! With the Rhoades Pond clipping, and the Cedar Creek Cleanup, I thought that since there are two events out there, for different areas, why not just join in, all of us? I'm going to the Rhoades event, but you could be involved anywhere! I have been putting this off, forever, but yesterday, I finally sat down and just did it. Finally! We have the Ifish Gear Page! People have been asking for ifish flags for as long as I can remember! Patches, too! Now we have patches, flags, sweatshirts, hats, and decals! What more could you ask for? I got my press packet for ICAST yesterday, and I'm looking forward to attending. I always think it is strange to see my name next to the words PRESS. Huh? I'm a pianist! How did I get that title? I'll have to write to them and have them change my badge over to Pianist. I'm going fly fishing today in the tide water. 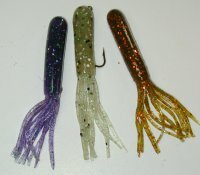 It would be much easier, and more productive to take spinners or bait, but not nearly the fun! I'd hope that you would take a minute to let us know how you feel about the new sturgeon proposal, here. Oh! Len Self has started doing reports on the board. You may access them on the discussion forum, by clicking here! Look for a story in the Oregonian this weekend by Bill Monroe. He is going to discuss the results of the duct tape thread he started on the discussion forum. I am enjoying this season so much! I am watching my little plants grow in the garden with tenderness, and watering them daily. Wearing tee shirts and shorts... it seems as if the seasons changed so abruptly! I miss my exotherms! Off I go-- Have a great day. The weather is divine, the fish are out there. Why not join them? I can think of nothing better! I suppose it's time to tell you about Miranda. I've been hoping that this would pass, and it wouldn't be a subject, but it has consumed my time and life so much, that it's all I really have to tell about. Miranda is my second best chicken. She is a beautiful, deep red Araucana. My first favorite is Bett, a beautiful big, fat, Barred Rock hen who comes to the door each night for crumbs. In fact, if the door is open, she comes right in, and cleans up the carpet. Sometimes she cleans and deposits, but that's OK.
We don't allow the dogs to beg during dinner time, but we do, the chickens. I don't understand why, but eating dinner with a chicken on your shoulder is common and accepted around here. Miranda came down ill about two weeks ago. We noticed that she wasn't laying. Her comb folded over and appeared pale. Soon, she wasn't eating, and one day, she just plain wouldn't move. So, we gathered her up, brought her inside, and began playing vet. It's a strange thing in Tillamook to have a pet chicken. Here, if your chicken is sick, it is simply culled from the flock. You wring it's neck, and eat it for dinner. In Tillamook, nearly every house that has a large "yard" has a fence around it. Some of the fences are high, to keep out the deer and elk. Some of the fences are electric. Some of them painted, clean and white. Animals are raised in these "protected" areas. Often times we see these "protected" animals outside of their fences waiting for a slaughter truck. I'll not forget the first time I saw the most beautiful little bull, brand new and still wet, sitting outside of a "protected" fence at a farm. I stopped to ooh and awe at it, and to congratulate the proud owners of this baby cow. "Want it?" Grunted the farmer. "It's going to be made into hot dogs." I tried so hard to talk Bill into a "protective fence" at our house so I could keep the baby cow. Our extended yard, is actually a meadow. Nearly two acres, and just perfect for a "protective" fence! Bill said no. I nearly stole the little bull and tried to keep it a secret, but I couldn't figure out the details. Hot dogs don't taste the same to me. Anyway, back to Miranda... She's sick. Very sick. She won't eat. She won't drink. We tried everything! Her little cage floor, inside the laundry room is littered with offerings: salmon, worms, bugs, berries, water, everything a chicken adores! She wouldn't touch them, and instead, closed her little eyes and dozed off. On Friday, I endured the embarrassment of visiting the local feed store. I asked what I could do. The Farm store in Tillamook is always crowded. After I opened my mouth, nearly everyone in the store, dropped their jaws and turned to listen. After the normal jokes about chicken dinners and axes on "neckses", I held my head up high, and bought a life time supply of antibiotics and worm medicine. A supply that was meant for a whole flock. Only trouble, Miranda wouldn't drink the treated water, nor eat the tiny pills. I don't know metrics, either, and couldn't figure out the dose for one measly chicken. Finally, on Saturday, I asked Bill. "Bill? Miranda isn't getting any better. I think she needs to go to the vet." Bill agreed that Miranda was sick, but was stifled by the thought of taking a single chicken to the Tillamook Vet. Oh! The ridicule he would endure at the local barber shop, if anyone found out! "Jennie, if you'll call, I will pay for it." I wasn't afraid. I called. Later, our local Dr. Cameron stared at the sleepy little hen, sitting on his large, farm size examination table. I have to tell you, I'm sure that he was surprised, and a little humored, but he handled Miranda with love, and did not utter a word that would cause us embarrassment. I like Dr. Cameron. Bill just hopes he doesn't go to the same barber. Two days later, Miranda is improving a bit. I administer antibiotic shots to her, twice daily, and I found a secret food that she adores! Nancy's Yogurt! She LOVES it, and she is eating and drinking! Miranda isn't all well, but I do see a little bit of improvement. Dr. Cameron said he gave the chicken a 5 percent chance of making it. We'll just see about that, doc! Our meadow has no fence, and our house is not painted white. We have no sign that screams, "Hedlund Dairy." We couldn't have a cow killed if we had one, and frankly, we just plain don't fit in. We live in a house that critters adore. We invite the deer and elk to roam, and we don't have squirrel proof bird feeders. In fact, I throw them hulled walnuts that are meant for baking. Yes, our address says Tillamook, Oregon, but they put folks like us way out on the end of roads, so we don't stand out. I will continue to bring you updates on Miranda. Until then, I try to go out as often as possible, and kill fish in public. I have to, to fit in. That way, the people of Tillamook won't think I'm totally a lost cause. Just a few notes, as I am late this morning. Miranda took four sips of milk today. Hope that's not bad for her. Andrew is going to go try for his permit today. David has a doctor's appointment. I've been busy trying to figure out the least expensive flight for us to get to Vegas to the ICAST show. I'm not doing very well, and am realizing how expensive this will be. YIKES! Shall we just not go? Working on that! I have to take the kids, because I have no other child care plans. Lessee... That's about all. Wish me luck with Andrew driving. Scary! Congratulations to "Rags" for winning the Lamiglas photo contest. John wins his choice of any G1000 or Certified Pro rod from the Lamiglas catalog! Congratulations, also, to the winner of the New Member Contest, for submitting a tip regarding using Listerine Mint Mouthwash to get out fishy odors! Congrats to anglerp! Miranda the chicken is doing, well... about the same. The vet gave her a shot of vitamin B and steroids, and told us that she is now, not allowed to compete in Olympic activities. We'll bear that in mind. I've been working all week, and after washing my car, I declare it time to go fishing! I have finally confirmed and reserved a flight for the boys and I to go to Las Vegas. We landed a super deal on a four night stay at the Tropicana. Since we stayed there last year, they gave us one night free, and the rest of the nights at $39.00. Can't beat that! I'll still be stuck with Taxi fares, but you can buy a lot of taxi fares for the price I'll save, by staying at the Trop. Miranda is frustrating me! When chickens get sick, they usually just get really sick and die, or get really sick and get better. This is day 5 on antibiotics. She won't eat or drink. She just wants to sleep. What do you do? I can't give up. So, lately, I have taken to hand feeding it a mixture of corn meal, egg, milk and bread. I simply open her beak, and make her eat! Is this right? Is this wrong? Who knows? It's all I know to do. I haven't been fishing at all. I'm trying to get some work done to have money to play while in Vegas. That might have to change today, though. I'm just about up to my ears in computers. I have to take Andrew to the doctor this morning. I'm feeling ill after trying to feed and give Miranda her shot. She has mucous coming out of her mouth. I feel so helpless. I've prayed for God to take her home, but it's not happening. She looks so pitiful. I just feel sick about it. Last night before I retired, I took the dogs for a walk on the river, and ended up staying longer than usual. In a small pool, nearly evaporated, there were thousands of pollywogs. This is a good sign! However, in that small pool were 10-15 steelhead fry. I had to save them! Unless a big rain came, these steelhead had hours to live. Back to the house I ran, to fetch two things: An aquarium net, and a shovel. There were two pools with active steelhead fry in them. One, which I could dig a channel to the main river, and one which held no hope but transport. Back to the river, I dug the channel, and was satisfied when a school of fry rushed towards the river, and exited the small pool that held them captive. Now, for pool two. Those critters are fast! I caught 8 to 10, and walked them to a slow, currentless place in the river, and let them go. I spent an hour trying to capture the last, most energetic fry, with no luck. I finally gave up. Perhaps the kids would be better at this? I ran to the house, interrupted the boys summer Nintendo-athon, and told them of my plight. They bit! After all, it's a little like a competitive computer game, right? Nintendo's latest game, "Catch the fry!" Well, maybe not. However, they did go finish the task. After that, up to view a movie I hadn't seen in ages. "The Red Pony." It was fun to revisit, even though at times, during this movie, I have to wonder why anyone would subject themselves to that degree of sadness. The finale, however, when Nellie's foal is born, puts you at rest, and eases you into a good night's sleep. To wake up to Miranda's suffering has put a damper on my day. I realize that not all in nature is supposed to live. It's really a harsh, nasty, and cruel world out there, when you greet the wilds of nature. Heroic measures were not meant to be. However, on that same thought, I can't bring myself to kill this chicken, even though there is nagging feeling in me that this would be the kindest method. There is a gnawing reality in me, also, that perhaps I shouldn't intervene with the steelhead that I saved, last night. Let nature take it's course, Jennie. Stop trying to fix things. This isn't my show. I'm going to stop the shots today, and let Miranda go. I'm going to rest in the thought that perhaps in trade, I have saved the lives of a dozen or more steelhead--whether I should have, or not. Miranda went home this morning, while I was at the doctor's with Andrew. I suppose it is a relief. You know, I tried to help her... I really did. Off to the shower, and to the fin clipping at Rhoades Pond. It's an absolutely gorgeous day, but somehow a deep sadness has been cast over this part of the coast. I just got back from Fred Meyers. You can feel it everywhere you go. Coastal communities are tightly knit and when someone grieves, it hangs over the entire coastal valley like fog. It'll take some pretty strong sunshine to cut through this one. I have something to look forward to, though, and it's bringing my spirits back. Stan Fagerstrom has invited Bill and I to be guests at the Big K Guest Ranch tomorrow, and I'm really excited! We will fish the Umpqua the next day for shad and smallmouth bass. 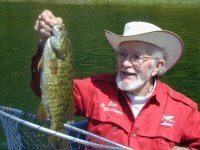 If you'd like to learn a bit about what we'll be doing, Stan wrote an article about this type of fishing, and you can access it by clicking here. First, Bill and I will drive to Florence to meet Stan for lunch. From there, Stan will join us in our car to finish the last leg of the drive to the Big K. We'll have dinner in the beautiful, big lodge, and lay our heads down in what has been told to me, "The most comfortable beds I've ever slept on!" I'll tell you. I'm ready! Is it time yet? Anyway, the whole experience sounds much needed, and absolutely divine! Hey Stan? I'm in! Let's go! 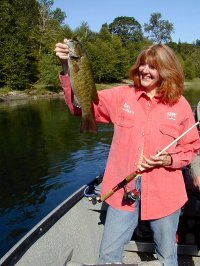 I'll be off to the Umpqua, now, to chase smallies and shad. Wheeeee! The kids and Shane will be home to take care of the house, and the animals. Wonder how much pizza and cookies will be gone when I get home? Still praying for the families of those who lost loved ones on the bar. I can't get those thoughts out of my mind. What a terrible event this has been. Whooooooo hoooooooooo! What a trip! I can't wait to tell you all about it, but I have to go through my pictures and tell the whole story! Stan Fagerstrom, THANK YOU for inviting me! It was wonderful! Big K-- Thank you for your wonderful hospitality! Your ranch is gorgeous! The fishing was amazing! I will tell all as I catch up! We have a new member of the household, Molly. 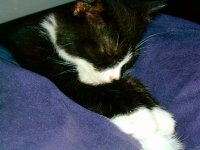 Molly is a little black and white kitty that is to be Jack the cat's wife. Now we have Jack and Molly. A cat marriage made in Kilchis heaven! I have SO much to catch up on! I leave for Black Butte in three days, so I'll probably catch up about the time I leave again! First, let me introduce you to the sweetest kitty, Miss Molly Mae... She's come to live with us, here on the Kilchis. On Monday, Bill and I drove South to Florence to Stan's home for lunch. I hadn't passed that way in quite some time, and had forgotten the delight at watching the scenery change. If you haven't driven south on 101 in a while, believe me, the vast ocean expanses and green lush rain forests are a constant entertainment. This coastal drive is well worth your while! It was a pleasure to be seated in the Fagerstrom kitchen! Stan's lovely wife, Anita, prepared a beautiful and most welcome lunch of clam chowder and lemon pie! Oh my! It was to die for! Once filled to the brim, we were off to a visit to the folks at Outlaw Baits. I was given a tour of the facility, and a short tutorial on what we'd be using to entice the smallmouth bass to bite. Outlaw Baits.. They oughta be illegal! Tubes in tow, ready for combat on the Umpqua, Stan and I headed out for the Big K Guest Ranch with Bill following close behind. Before we knew it, we were headed up a long gravel road that landed us in paradise... The Big K! Stan had mentioned it to be a bit like the scenery where Bonanza was taped. He was right! I'd never seen Oregon look this way before! The Big K is located on a vast expanse of land that opens up all around you! Acres of rolling hillsides that tempted me to take part in their offering of trail rides by horseback. I'd have to save that for a return trip, as the day was wearing long. We were ready to check into our cabin and clean up for dinner. After a nice dinner, we retired to an exquisite and luxurious cabin on the hillside. It was the first time in perhaps three years that I had gone without computer, television, or telephone contact for more than 24 hours. I was in heaven. Up at five, we showered for breakfast, and were welcomed to breakfast in the Big K's bright, sunlit lodge with a cheerful smile from Kathy Kesterson. The Big K is the Kesterson's dream ranch, and I was rather taken with every member of the family. --Especially big Al Kesterson. Al is a very large and tall man! He joined us at dinner, and I found myself listening to his words intently, and realizing that while doing so, I had a broad grin on my face. I was taken with him, and found myself appreciating his family, and realizing what a wonderful job he had done raising his family, and creating this paradise in the valley. His hope and enthusiasm for life radiate through his family's smiles. They all work and live near, or on the ranch. I want to go back, just to be entertained with more "life on the ranch" stories, as told by Al and family. At the close of breakfast, Scott Wolfe, our fishing guide for the day, came to sit with us and chat about the order of the day. We put in our sandwich orders for a shore lunch, and followed him out to the drift boat. We grabbed our lunch, and off we went! It was a short ride down a dirt road, right below the ranch to the launch on the Umpqua. It is all catch and release at the Big K. You can see the effect of this, by gazing into the 10 to 12 foot visibility to the amazing structure that makes up the Umpqua river bottom. Smallmouth bass are everywhere! You can watch every bit of the action if you like! I spent the day bent over the side giggling at every bite! There is a lot of giggling to be done in a full day's fishing for these scrappy fish! Bill, Stan and I caught fish in constant motion all day long! With light spinning gear, we cast plugs or Outlaw plastics. 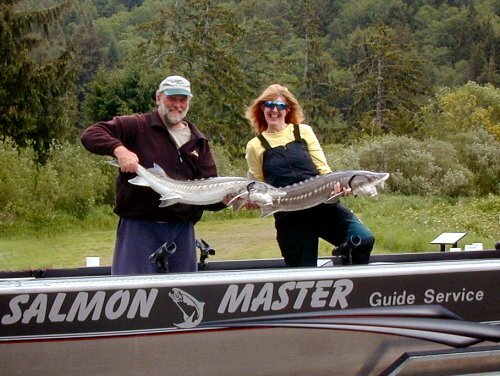 We found eager fish willing to take our lures, both under the boat, and with longer casts. At times, we would witness a half dozen fish chasing our offerings! Now, that is action! Stan Fagerstrom admiring a fine catch! Our guide, Scott Wolfe, was awesome, and kept us comfortable and entertained throughout the day. I'll tell you what. I've often been asked where to take children fishing. This is undoubtedly the best option I've found to date. It's fishing like it may have been fifty years ago! It's fishing that will have a child begging for more! It's fishing that I've never experienced in my life, and I am dying to get back there! It's no wonder the Kesterson's have such an open and loving heart when it comes to welcoming and caring for their guests. As they join you at the dinner table, it becomes obvious that their hearts mirror the vast expanse of open land that they have grown up on. The Big K Guest Ranch is a place in God's country that has captured my heart, and fed my soul. Sprawling free over 2500 acres, and sparsely touched, it is a land that God created, the Kesterson's preserved, and have opened for all of us to enjoy. Dead Tired. Woke up several times last night. I want to go to Black Butte and see my family, but I don't want to leave Kilchis, Miss Molly Mae, (Priscilla Simmons for short) Phoebe the sugar glider, or Dee Dee... Or-- my river! Bill is staying home and has promised me over and over that he will take wonderful care of them. I agree that he will, but still. I will miss them all. I will take my lap top and perhaps make a few short entries. It might be easier if I do them on a thread on the Bulletin Board. I think I'll do them here on the Life in General Board just in case I'm not catching fish! Just look for any Black Butte posts from me if you want to know what's up. If I'm into the fish, perhaps I'll have a moderator upgrade me to the fishing board! Miss Molly Mae is getting along famously, and the boys just adore her. She is extremely curious and gets into everything! Well, I have to plaster the bikes onto the bike rack with bunjy cords and get going. Smother over salmon and bake as usual. Well, I am off to the races! Have a great week! Annual family get togethers hold the same kind of emotional ups and downs as does Christmas for me. There is so much history, and so much expectation! Deep inside me, I have such wonderful memories of our weeks of summer follies! As we turn left to enter Black Butte Ranch every year, memories flood me. Visions of a line of bicycles headed towards Glaze Meadow pool from our rental houses. I hear ghosts of shrieking laughter as I glance back into time. Kids tumbling off of bikes, towels dropped. Choruses of songs that we have gleefully sung together hang in the air. As I drive through the loop, my car window open, I look to the left and hear my Mother's voice, as we rode our bikes past the lodge. "Oh! Jennie!" She'd exclaim. "Listen to the quaking aspens!" My Mother is now gone, and the kids have grown from three feet, to six. The talk between this generation of Mothers now revolves around teenage and young adult issues. What college will they be attending, or which child is allowed to drive which car, and to where. Thirty years ago, my sister and I used to compare tan lines. This year I kept telling myself to stop noticing the sun damage on my reflection in the mirror. Each spot represents a wonderful day in the sun at Diamond Lake. Each smile line, etched a little too deeply by my eyes, a reason to smile again, and to remember. Things are so different, but other things remain ageless. A game of Scrabble is always going at the table inside the cabin. Thirty years ago, it was my Aunt and my Mother. Now, it's David and Andrew and I, carrying on the tradition. "What do you mean "loucrine" is a dairy term?" I ask David. He returns that he's never heard of the word "hominy" either! After dinner, the kids still gather on the golf course for a game of Frisbee. No matter the generation, the whole week grabs back into the past for all of us, and searches for our past. It is successful, in many ways. Black Butte brings out the child in all generations present. Thirty five years ago, I remember my first game of spoons. It began in a lodge at Diamond Lake. Spoons is an easy card game. If you have 12 people, you lay out 11 spoons, all splayed out on the table, with the handles pointed towards the players. A deck of cards is started by one player, who one by one, picks up cards until he has four. The starter keeps picking cards, but now passes the fifth one on to his neighbor, until he also has four cards. The goal is to gather four of a kind, and when you succeed, you secretly grab a spoon. The game is frantic and fast. While trying to get four of a kind, you have to watch the spoons. If you see one missing, or see someone grab one, you will want to get one too! There is going to be someone left out, so, most often, the spoons just fly! I can remember being kicked out of the Lodge at Diamond Lake because chairs were flying! The spoons we borrowed from the Lodge restaurant were not returned in the same shape we borrowed them in! One night after dinner, I left to go fly fishing on the lake, before night fell. I missed the spoons game, but I heard stories the next morning! New rules have been written to the spoons game. I guess Andrew bit David, during the fight for the spoons. I'm so sorry I missed it! After David shrieked about the bite, Linda stood up with the time out signal and said, "It's OK! Biting is allowed!" We are a rough bunch, and spoons is a game to kill for. Luckily, the spoons at Black Butte Ranch are a bit higher in quality, and hold up to our violence. The weather at Black Butte was chilly and cold this year. We ignored that, and held to tradition by swimming at Glaze Meadow, anyhow. The adults took an evening off, left the kids with pizza to cook, and we headed towards the Kokanee Cafe at the Metolius. The dinner was exquisite. Chef John Martin prepared the meal. I had the Seafood Brochette with mango salsa. It was the best dinner I have had in ages! Our waitress was Angela, and she was wonderful! If you go, please try the blue cheese vinaigrette. I ended up persuading the chef to sell me a small quantity. The next night at dinner, we prepared the 37 pound spring chinook I caught, and had green salad and the blue cheese vinaigrette. Even those who didn't prefer blue cheese dressing were raving about it! I'm trying to get the recipe, and if I do, with permission, I will print it here. All high hopes and expectations are always met, in one way or another, as our family gathers in the summer for a week of fun and follies. Things never stay the same, yet traditions are always honored and revisited. A game of Spoons, a game of Scrabble... a day at the pool... and long bike rides around the loop. In the morning, it is my Father who sings "Good Morning Mr. Zip, Zip, Zip, with your hair cut just a short as mine!" instead of my Grandfather. It's a week of wonder, and memories, and ever changing relationships, with a solid binding tie of something that can never change. Something that we will always have in common: Family. There will be expectations unmet, and hurt feelings here and there. Flexibility is needed to accommodate all... but it's family, and it's irreplaceable. A family that I thank God for, and am ever so lucky to be a part of. I'm getting so frustrated with my river. The pools where the steelhead fry lay are getting more shallow with each summer day. Do I dig out a trench that goes to the main river, and help the steelhead fry from drying up with the pool? If I do that, then I risk killing the pollywogs that live there. Playing God is difficult. Or shall I just leave it be and let nature take it's course? I'm thinking of putting up a sign. "No trespassing! Pollywog spawning grounds!" Only problem, Kilchis doesn't listen one little bit, and goes running full speed through the pool, pollywogs flying! I spend hours on my knees watching all the life in these pools. It makes me pause to think... Does life like this always occur here? Are my wading days in the Fall over, now that I realize how many things I could kill by trudging through? Geez! Give me a break! Pretty soon I'll be tip toeing through the lawn, wondering what kind of bugs I'm killing! I guess there needs to be a limit here somewhere in how far I'm willing to go to save things. After all, if I take too much care in saving these steelhead fry, will I really feel alright bonking them, come winter? Now, if I say what I was thinking, I'll have to take out the word, "right". "Sometimes I stop to think that if I had the right influences around me, I could not ever bonk a salmon or steelhead." The word "right" there, suggests that it is correct to not bonk a salmonid. "Sometimes I stop to think that if I had the wrong influences around me, I could not ever bonk a salmon or steelhead." So, you've got me. I'm stuck on what is right, and what is wrong. I guess what I am saying, is that the older I get, the more delicate I feel about stealing any creature's life from them. Life is precious, no matter in what form. Still, deep in my cave woman self, there lies an urge to catch, seize, and bleed them! Cook them up over and open fire and eat them! I think the balance lies somewhere deep within. Perhaps I'll bonk the salmon, then tenderly skip over the pollywogs in the shallows, leap over the lawn, (as to not kill any bugs), and sit on my kids while I cook and eat the salmon. You have to be selective, after all. I'm sorry, but I laughed so hard when I wrote that, that I just have to leave it up! Can you tell summer time kids have me a little crazed? LOL! I've been hearing the eeriest noises outside, as of late, and last night I was finally able to identify them. Coyotes! In my yard! Like, real close to the house! Of course, the dogs notified me in the middle of the night that they were present. What an eerie sound! The boys were out in the tent on the river. I bet that was scary! Jack, our household cat has been missing before, but this time it worries me. I haven't seen him since yesterday. Cats and small dogs disappear around here quite frequently. There has also been a cougar spotted around our house, on our side of the river recently. I hope Jack comes home. Bill and I have decided to keep Molly May an inside cat at night, and perhaps Jack, too.. Too many critters. I hope that we get a second chance on Jack. It's cool here, and foggy. Perfect day to go fling flies in tidewater. Yip... That's what I'm going to do! Countdown to Las Vegas ICAST meeting! Eight more days and I fly off to the desert with Andrew and David. I've made my manicure and pedicure appointments. What on earth else would I need? We had really strange big raindrops this morning, and huge clouds are hanging from the sky. It was like a desert rain. Strange, here on the coast! I am having to make up 8 cups of hummingbird food a day, every day lately! I fill five feeders in the morning, and by nightfall, have to refill them! They are wild! Sometimes I have 15 on a feeder at a time! It's scary! When you fill them, you get dive bombed! Off to church this morning, and onto Costco to find out if they'll do anything about Andrew's laptop. I feel so badly about this, because Andrew uses it for school. I also feel a bit bad because, in actuality, Costco has no reason to help us out. It's past their return date. I can't believe they'd even be interested in looking into it, but... since they asked, I will bring it in, with the whole story. I am a little bit nervous about the new marfan findings. Andrew and I have our aortas measured each year. Last year, Andrew's took a huge leap, and now must go in every six months to be checked, rather than each year. His measures as much as mine. 4.4 cm. I've been watching mine creep up for years, and have always kept in mind the 5.0 cm recommended for surgery to replace the valve with either a pig valve, or a St. Judes Valve. Uh oh! I read recently that the top surgeons have changed their minds now. 4.7 cm is the new standard. We are getting close! That is scary! I don't want open heart surgery for either of us, and I don't want an artificial valve in either of our chests! However, I have heard that the artificial valves cause a ticking that you can hear all of the time, and that it can be quite helpful as a metronome for music writing. My only question is this: What happens if you want to write something in a faster or slower meter? I had a clock in my Astoria home, when I was at the height of my music writing. I didn't realize it, but that clock was really loud, and all of my music was written to that beat. A friend of mine has an artificial valve and she says her husband finds it soothing, because he knows at night, that she is still alive if he can hear her ticking! Hey, let's look at the bright side! Off to church I go... Hope you enjoyed the beautiful sunshine. It's now supposed to change to rain. That will be nice, too. Congratulations to Eric, "Dakotan" on ifish! He won the Lamiglas rod on the Springer Contest! Please click on the contest to see this beautiful fish!!! WOW! Lots of computer work to do today... It's a great day for it, because it's rainy and bleak! I kind of like it for a change. Off to get coffee and to "listen to the song of life..."